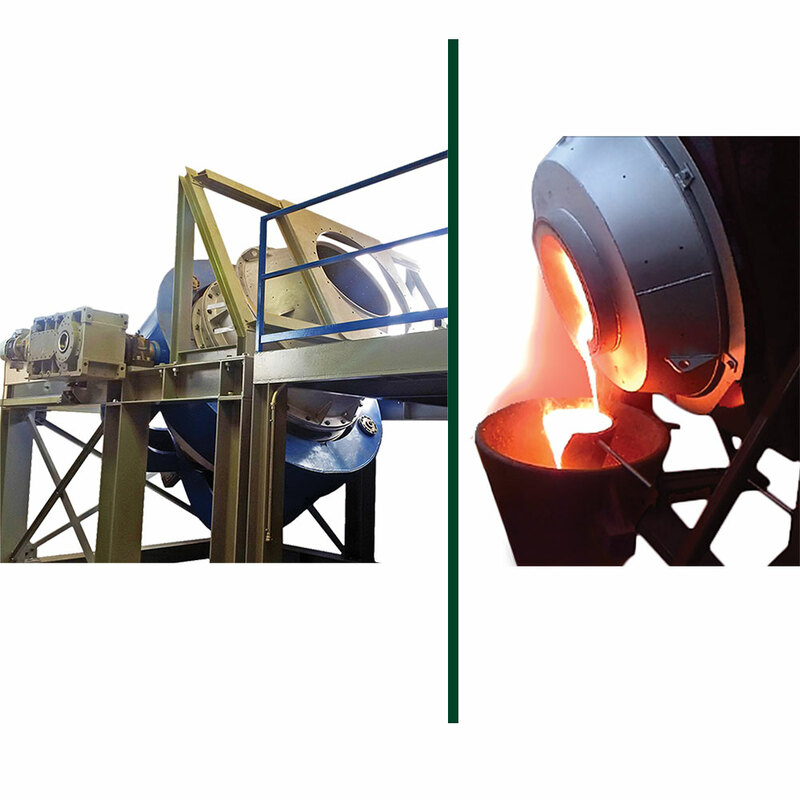 The TBRF is a pyro-metallurgical furnace which has many applications. Treatment of electronic/electric scrap as PCB, batteries etc. Inclined angle, about 30° for firing and metallurgical oxygen blowing. Rapid rotation to mix reagents with fluxes during smelting phases, and to disperse slag and expose metal for oxidation stages. 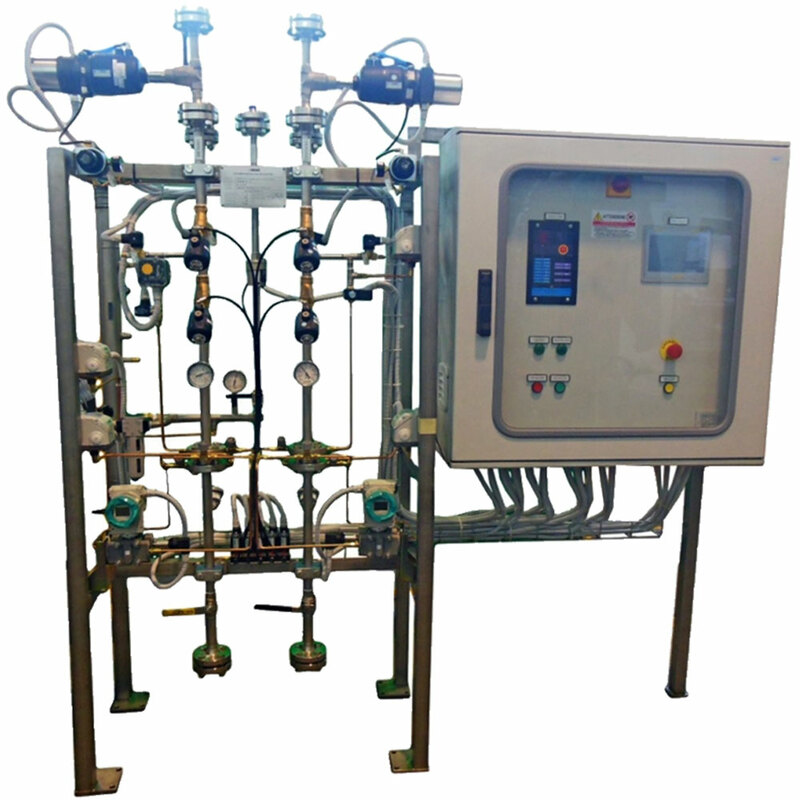 The furnaces up to 200 liters of volume are mounted on skids including the electric control panel and the gas ramp. The vessel consists of a carbon steel flanged cylinder bolted with a carbon steel cone onto the top flange and a thick carbon steel base-plate to the base flange of the vessel. 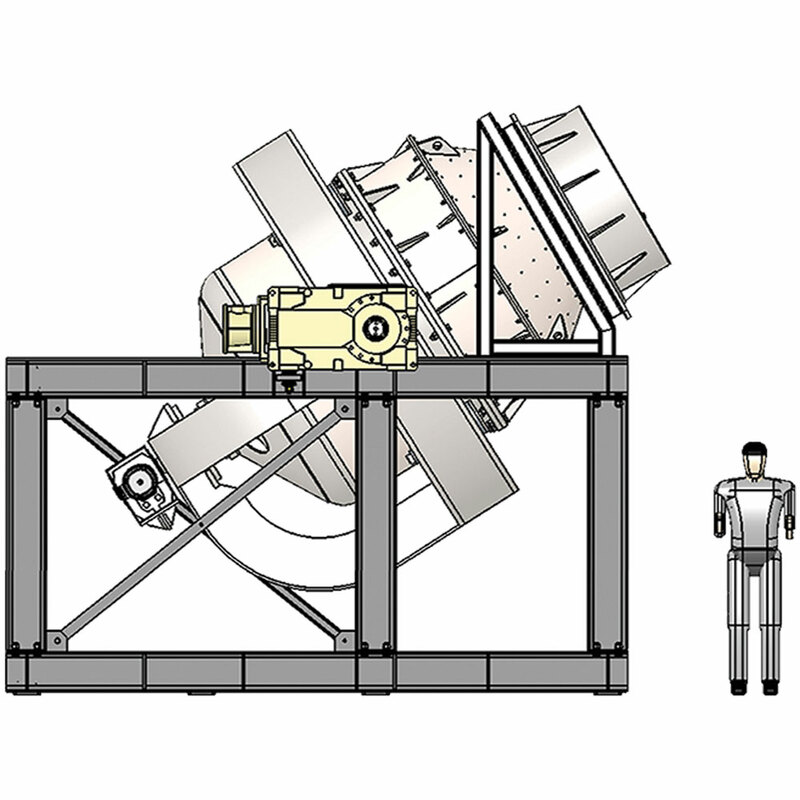 The motorized drive shaft is bolted to the carbon steel base-plate, and located on the tilting frame of the plant. The vessel is lined with special refractory bricks. 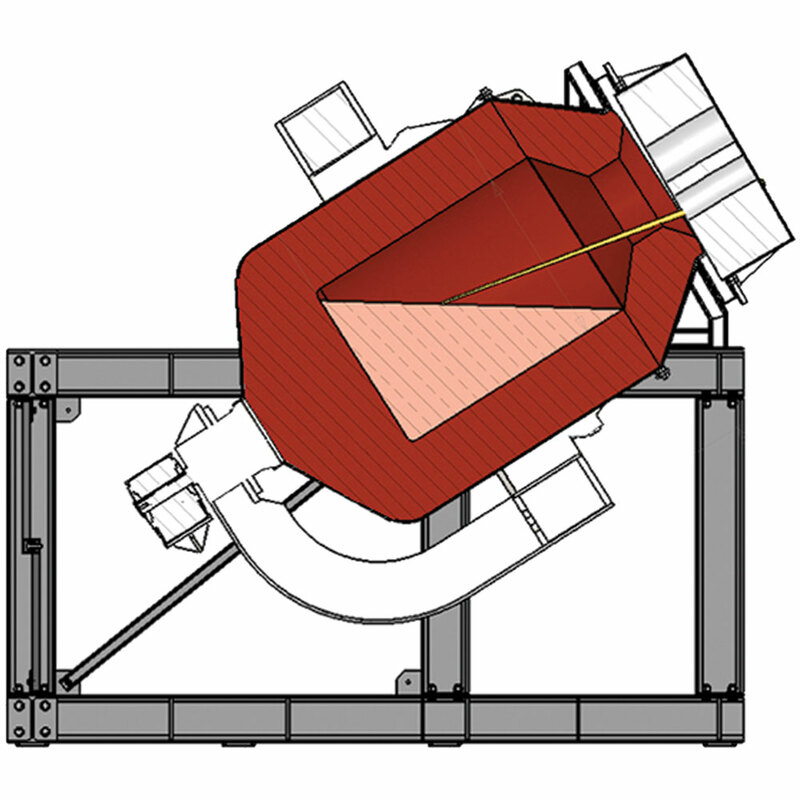 The wall thickness of the refractory depends on the size of the furnace with a minimum of 200 mm. The standard rotation speed of the vessel is about 2-10 rpm and the tilting one about 1-2 rpm. The vessel’s rotation is controlled by a variable speed gearmotor powered with an electric engine controlled by inverter and mechanically fastened to the vessel’s frame, the positioning of the furnace during tilting/pouring movement is totally contolled by rotating encoder and PLC. The choice of the electric engines instead of the hydraulic ones increased the operational safety in all the working conditions and the preicise positioning of the furnace to ensure a perfect separation between slag and metals during pouring operation. The burner is provided an oxygen-fuel mixture (on request also with air-fuel) capable to reach temperature of about 1300 and 1500 °C respectively. The gas ramp controles the stoichiometry of the flame regulating the perfect ratio of the gases. The electric panel supervises the tilting and rotation speed and movement and the correct functioning of the burner. The burner consists of a concentric pipes (ceramic or metallic) with different diameters and it’s mounted on the rotating or fixed hood used also for the evacuation of the fumes. A local panel (portable of fixed) is used for the control of the operational control of the furnace as tilting and rotation.